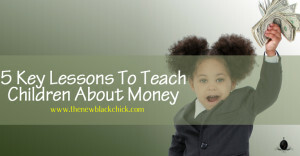 Time for some finance basics for those new black chicks among us who don’t have exposure to how to manage your money. I had a class in high school that taught us some basics about budgeting, stock market, etc. My parents taught me some other basics, but for the most part until I studied it for four years I didn’t really understand it. Let’s cover some money basics to get everyone moving toward the same level of understanding. From a previous blog post you may be aware that low-income neighborhoods suffer from a lack of banks. But you may be from a neighborhood with a bank on every corner. If no one ever taught you about the basics of managing your money, you don’t know where to start. There are so many resources out there for you. I happen to like Suze Orman. If you’re looking to learn about money, develop good money habits or change your monetary state of being she is a good resource. She puts things in simple-t0-understand terms. Two things I want everyone to focus on. If you’re still in high school this is definitely for you. Start off right. My Dad set up a back account for his photography business and made me a signature since I was too young to have a checking account. This taught me how to deal with a bank. I was intimidated by banks. Keep in mind when I was young there were very few ATMs. I was a young black girl walking into this cold bank asking for money…my money. Open a checking or savings account even if you’re in high school (you’ll need a parent or legal guardian signature). Start making deposits, develop a budget and pay your bills. The thing to stop doing right now is cashing your check at a check-cashing place. Stop it right now. Sort of like liquor stores on every corner in certain neighborhoods, these places have the same goals. And those goals do not serve you. There are no banks or credit unions nearby – If you have internet access, there are plenty of online banks that don’t have physical locations. Everything is done via the internet and ATMs. Banks charge a lot of fees – yes, many banks do. Stick to local or internet-based banks that charge little or NO FEES. All banks will charge an overdraft fee. Check out the fees and use your budget to make sure you don’t become over-drawn. I don’t have access to the internet and/or a computer – you can go down to the local library to use their internet for free. If you have a car or a bus pass, even better – drive to a neighborhood with banks. What if the bank goes bankrupt – make sure your bank is insured by the FDIC. This means your money is protected from bank failure up to a certain dollar amount. Check cashing places are so convenient – yes they are. They collect more fees to cash your check than a bank does. A bank doesn’t charge you to make deposits! YOU ARE PAYING SOMEONE TO GIVE YOU YOUR MONEY. Don’t I pay the bank to let me use my money – to a certain degree yes. A bank actually makes money by using your money (that’s a whole other discussion). If you’re at a no-fee bank, this won’t be an issue. What’s the difference between a credit union and a bank – various rules are different, but the basics are the same. Credit Unions may require membership, potentially charge fewer fees. It’s hard to open a bank account – no, it really isn’t. You can do it online in a matter of minutes, or go into a local branch. Putting your money in the bank is the best way to build it, grow it and manage it. Open a bank account TODAY. In fact open a checking and a savings account. If you have a job with direct deposit available sign up for direct deposit and you never have to worry about physically visiting the bank to make a deposit. Also set it up so that 10% automatically goes into your savings account and the rest goes to checking. Watch that savings account grow over time and avoid using it until absolutely necessary – just ENJOY watching it grow.